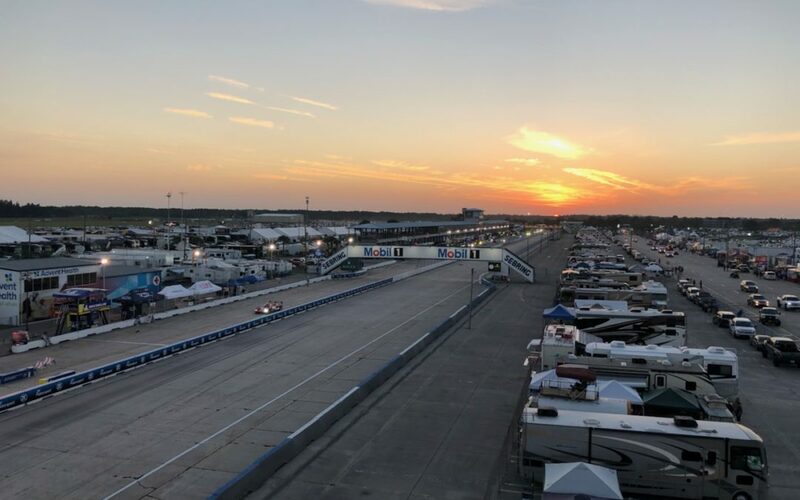 This past weekend was not only the historic 12 Hours of Sebring, but for the first time, the WEC (World Endurance Championship) also put on a 1,000-mile/8-hour race on Friday evening. Sebring is an iconic sportscar venue and a staple on the IMSA schedule, and this event was even more special with the addition of the European teams. The event was so big that the track actually added an additional pit lane on the back straight for the WEC. It’s really interesting to see how European sportscar teams and rules differ from what we have here in North America. Specifically, the paddock setup leads right out to their pit box. Ergonomically, this makes things much more efficient because you have easier access to everything, whether it’s in the pit lane or the paddock. Also of note, the series uses tire warmers. It was so interesting to see the structure in place for tire changes, including racks with big heat blowers. On a personal note, I was at Sebring to drive IMSA Hot Laps, which were a huge success as always. There were a record number of fans at Sebring who were ready for the chance to win a hot lap! With the size of that track, Sebring always draws some of the biggest crowds of the year, but this year was bigger than ever. Whenever I’m driving laps at Sebring during the 12 Hour weekend, it makes me appreciate just how many fans there really are: the whole circuit is lined with motorhomes, campsites and scaffolding. And those campsites are a unique sight, unlike any other track we go to! Another highlight of the weekend was the annual Lemons of Love MX-5 Cup car raffle. For a $100 ticket, you are entered into a drawing to win a Global MX-5 Cup car from Mazda. The Lemons of Love charity was started by a cancer survivor to give care packages to cancer patients who are undergoing chemo. It’s a special charity because the founder is a woman in the racing community, so the tie-in with Mazda is a meaningful connection. The winning Lemons of Love ticket was drawn Saturday morning before the race. Maybe we’ll see the winner on the Battery Tender Global MX-5 Cup grid this season, which has its first race this weekend at Circuit of the Americas along with IndyCar. This year, we’ll see split classes in the series, with the 2019 ND.2 class and the original ND class. I’ll be heading to the track to work with the series, so I’m excited to report about our season opener next week!